I am so excited to see such wonderful growth in the garden. We have been getting a lot of rain, and it has helped with our plants establishing a good root system. I hope that you enjoy the pictures below! Everything is doing very well. We have five different tomato varieties, which were gifted to us. They were from seeds purchased through Johny's Seeds. In the photo below, the varieties are listed from left to right. Japanese Black Trifele, Red Grape, Matt's Wild Cherry, Black Cherry and Persimmon. 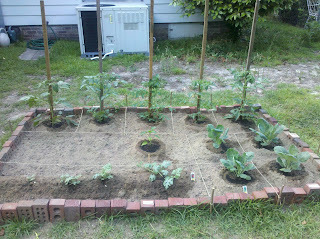 If you will notice in the picture below, the tomatoes were all planted along the back of the garden. I did this in order to get the most sunlight and prevent any shade casting on other plants towards the end of the day. Aubrey has a new vegetable that she has been cooking and really enjoying. 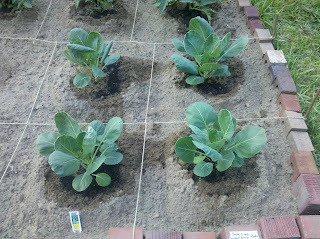 When we visited the Cayce Farmers Market on 4/23/11, we picked up some plants. I asked her if she'd like me to grow her some brussel sprouts? She was so excited, so we picked out some of the Jade cross variety. See the picture below, they appear to be doing very well. In the South, everyone loves watermelons. I have many fond memories of when I was little and our family would gather in the living room and eat a large watermelon. Mom would put out newspaper on the living room floor, to catch all of the sweet juice and seeds we would spit out. Dad would be in the kitchen with his big knife, cutting the melon in two. Jenny and I would get a half and Mom and Dad the other. Mom and Dad ate there's by the slice, juice dripping and seeds spitting on the newspaper. Jenny and I preferred to eat our melon using a melon ball tool. I vaguely remember us only having one of these, so it was always a challenge for us to share the coveted tool. So with such an ingrained memory, how could I resit the desire to try and grow delicious melons for ourselves? I bought and planted four Sugar Baby watermelons, and I really hope that they will do well. Aubrey and I both love bell peppers, and therefore we will usually grow several varieties. So far, I only have planted one type and that is the Purple beauty. This one was picked up at the All Local Farmers Market from a vendor from Greenville, SC. 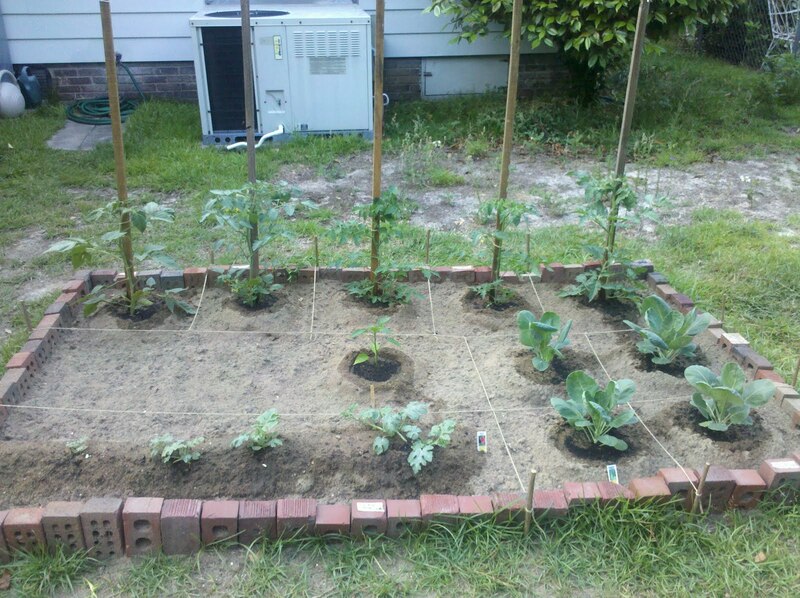 Below is a photo of the watermelons and the Purple Beauty bell pepper. 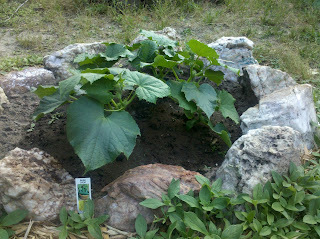 Last, I planted a bush crop variety of cucumber. 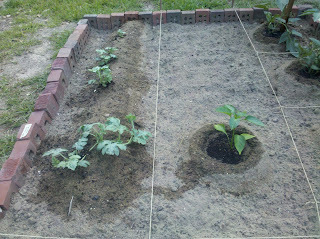 I have never grown cucumbers before, but I have grown squash and I feel that the experience will be somewhat similar. Although the bush variety will be compact I am still going to construct some type of trellis for them to climb on. Well I hope you enjoyed the little tour of our garden. 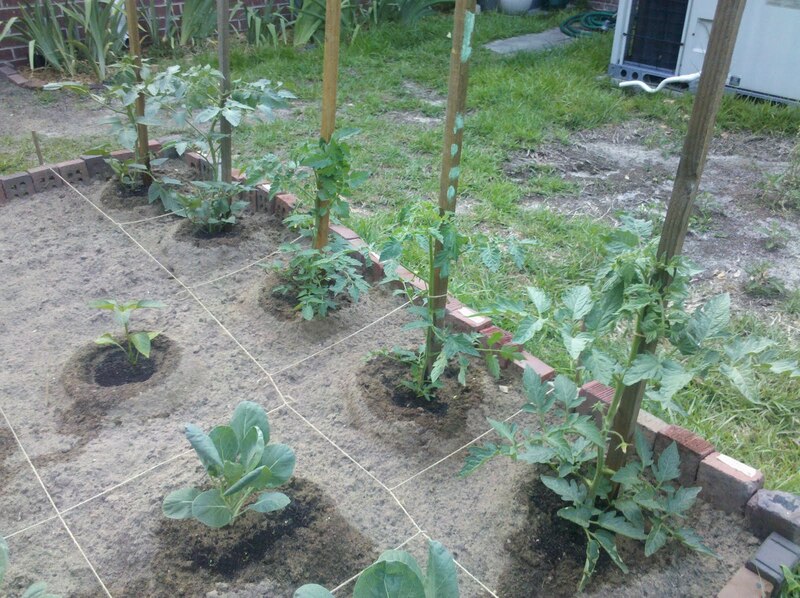 I will post progress reports as the garden starts to fill in. I'm so proud of all the work you've done so far this year! We're going to have so much goodness from the garden to eat this summer.